Next year’s STAGECOACH–set for Saturday, April 30 and Sunday, May 1, 2011–not only marks the annual music festival’s fifth consecutive year, it also features the return of some of country music’s top charting artists to the beautiful Empire Polo Club in Indio, CA. Kenny Chesney, Rascal Flatts and Carrie Underwood head a musical line-up that celebrates more than five decades of country and will include performances from Darius Rucker, Loretta Lynn, Josh Turner, Leon Russell, Easton Corbin, Gatlin Brothers, Jack Ingram, Mel Tillis, Rodney Crowell, Wanda Jackson, Rhonda Vincent and many more (the full line-up as of October 27 is below). 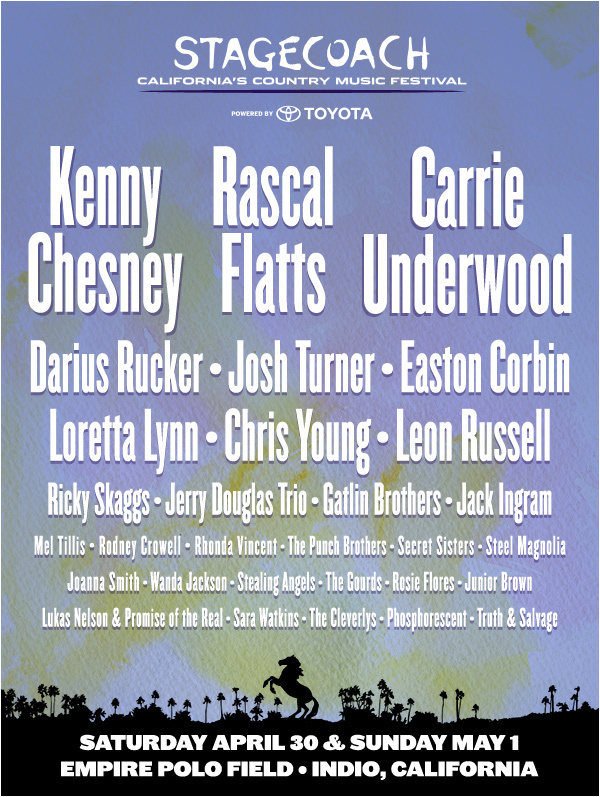 Tickets for STAGECOACH…CALIFORNIA’S COUNTRY MUSIC FESTIVAL POWERED BY TOYOTA go on sale Friday, November 5 at 10:00 AM at all Ticketmaster locations and Stagecoachfestival.com. $99 two-day weekend passes are available for a limited time and layaway options (details of which are posted at the website) will again be in place. Children 10 and under will be admitted for free. 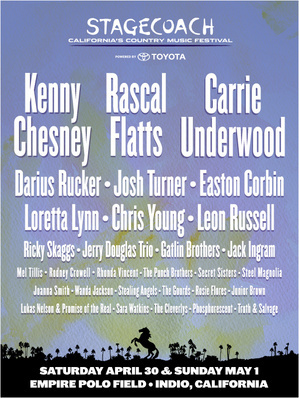 The STAGECOACH 2011 line-up (as of October 27) is as follows: Kenny Chesney, Rascal Flatts, Carrie Underwood, Darius Rucker, Loretta Lynn, Josh Turner, Chris Young, Leon Russell, Easton Corbin, Ricky Skaggs, Jerry Douglas Trio, Gatlin Brothers, Jack Ingram, Mel Tillis, Rodney Crowell, Rhonda Vincent, Secret Sisters, Steel Magnolia, Joanna Smith, Wanda Jackson, Stealing Angels, The Gourds, Rosie Flores, Lukas Nelson & Promise of the Real, Sara Watkins, The Cleverlys, Phosphorescent, The Punch Brothers and Truth & Salvage.